A little over a week ago, I was perusing some pictures of forthcoming Frostgrave figures on the North Star Facebook page. I noticed that there was a picture of a mid-1800's figure, with text indicating that North Star would mail out a sample figure of this forthcoming range of 1864 Danes if requested. Like a shot, I put in my request, and on Friday I got the figure. This is for the North Star 1864 range, which is aimed at the Second Schleswig War, which besides being an interesting war fought between Denmark and Prussia/Austria during a time of political and technological change, is also the subject of a recent TV series. Below are a series of pictures comparing the figure I revived (one of the pack NSD003 - Danish Infantry at the Ready. 1864) with some of the various figures I had in the lead mountain. As you can see from the above picture, the figure falls nicely into the "28mm" size, although it is a bit smaller than some figures in my collection. To the eye, I would estimate that this casting is only 27mm, and it is substantially more slender than the GW figures. This may be in part due to this figure being a younger man, as you can tell from the face. The casting seems to be fairly good over all, with no obvious mold lines, and just a bit of flash and a bit of extra metal on the bayonet which needs to be trimmed away. Being unfamiliar with the equipment of this army, I can not comment on the uniform or the pack, but it seems to fit with the few pictures I have seen. All in all, I think this figure would be great en mass, and would probably work out ok for single mounted skirmish type gaming. This weekend past, I was staying at the home of my wife's cousins, and had the opportunity for some board game action. Aside from the now obligatory 7 Wonders game, we also played a session of Axis of Villains, a game I got for my birthday last year. In this game, you play one of four super heroes from the Justice League, defending the Tower of Justice from waves of villains who advance relentlessly to the tower to destroy it. Each player rolls a d8 and a specially marked d6, which moves or adds villains to the board. In our particular game, the Justice League lost, partly though some bad batches of die rolls (I think I added about 10 villains to the board), and partly though not understanding that we should team up against pretty much every villain, regardless of apparent strength. Late in the game, as shown in the picture, we had three villains stacked on one sector and we were unable to defeat them before they reached the tower and destroyed it. Even though we lost, the game was pretty fun, and its difficulty level was perfect for the late night. This is one we need to try again some time, and it also has a fair amount of solo play value, as there is no reason that one player could not play the various heroes together, and the villains are already played automatically. I also need to get three more d8s for next time, as the game only comes with one and it is much more satisfying to roll a whole handful than it is to roll the same die multiple times. 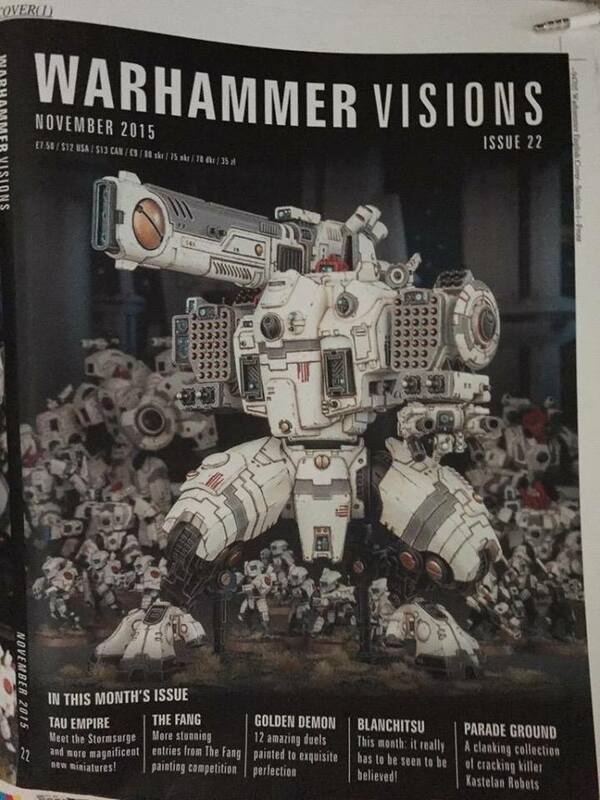 New really big guy "KV128 Stormsurge"
Now you may recall that I have a bunch of Tau, and that I even painted some... so I am of mixed emotions about these new guys. On the one hand, new kits might be more things I am interested in adding to my army, or at least new bitz, but on the other hand, I am not really keen on these new firewarriors, and large battle suits are pretty pricy. We will see how it goes in a month or so.